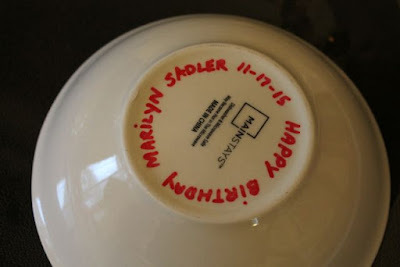 Last July, at a local author fair, my family had the opportunity to meet Marilyn Sadler. At the time, we knew her only as the author of the P.J. 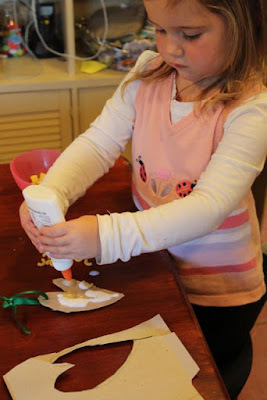 Funnybunny books, but this week we learned so much more! 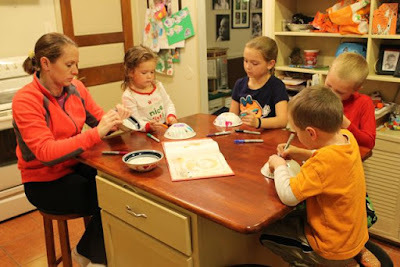 We learned she is one of the most successful children's authors from Ohio, a children's television producer, and has written picture books for over 30 years. 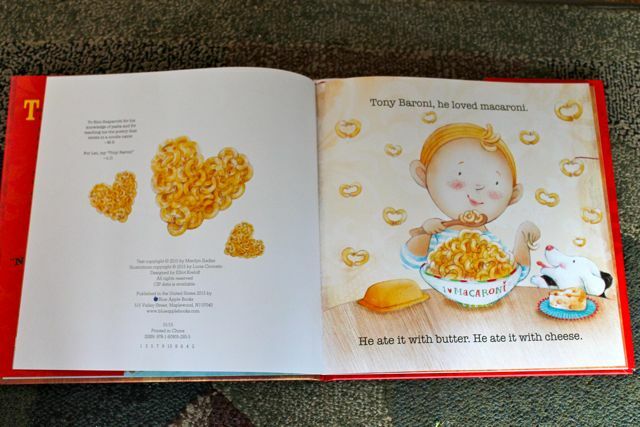 Plus, one her latest picture books is about one of our favorite foods, MACARONI AND CHEESE! Marilyn Sadler is the author of over 35 books for children including P.J. Funnybunny Camps Out, Alistair in Outer Space, and Ten Eggs in a Nest. She attended college at Ohio State University and earned a degree in fine arts. Her first job was at the Cleveland Museum of Art as the registrar. (Cleveland.com). As her website states, "she assumed she would be an illustrator," but after working as a freelance copywriter on a project with artist, Roger Bollen, things went a little different than expected. She started writing books with Roger and discovered that "writing was her true love." (Cleveland.com). The duo sold their first book, Alistair's Elephant in 1983. Their next book was It's Not Easy Being a Bunny featuring P.J. Funnybunny. This book was very successful as it was included in Dr. Seuss's Beginning Book Series. The book was ranked #144 on Publisher's Weekly list of top selling children's books of all-time. My family highly recommends both the Alistair series and any book with P.J. Funnybunny! In addition to her children's books, Marilyn Sadler found success in children's television. Her chapter book, Stuck on Earth: Zenon, Girl of the 21st Century became one of Disney Channel's most successful movies. Alistair was featured on Reading Rainbow and P.J. Funnybunny starred in three television shows. Also, Marilyn Sadler created the highly acclaimed Handy Manny show for Disney Junior. "Handy Manny started with Marilyn Sadler and Roger Bollen; I guess it was some execs at Disney who were looking for a preschool show for boys. Marilyn and Roger were sent off with that mission and they came back with this idea of a repairman with talking tools. They pitched it to them, and it was off and running." (Handy Manny Producer Rick Gitelson, Wired.com). On your next trip to the library look for Marilyn Sadler's latest picture books; Alice from Dallas (illustrated by Ard Hoyt), Tony Baroni Love Macaroni (illustrated by Lucie Crovatto), and Charlie Piechart and the Case of the Missing Pizza Slice (illustrated by Eric Comstock). 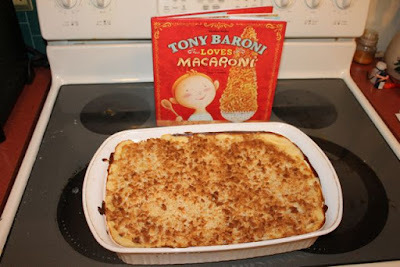 Marilyn Sadler autographed one of those new books, Tony Baroni Loves Macaroni for our family at the local author fair. When I opened the book this week I immediately had two activity ideas that I knew would be perfect for Marilyn Sadler's birthday celebration; macaroni heart-shaped ornaments and "I Love Macaroni" bowls. Two activity ideas from one page spread. 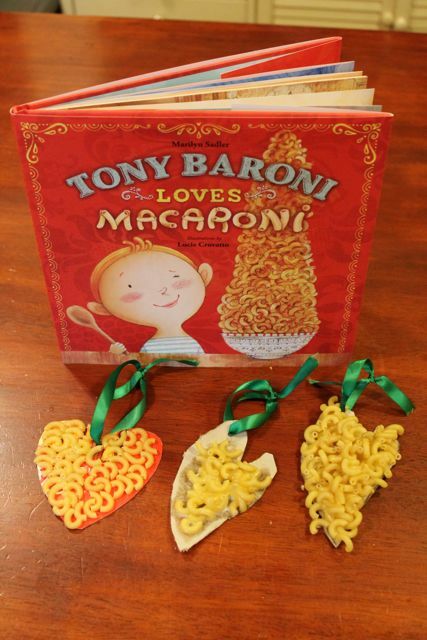 Tony Baroni really loves macaroni. 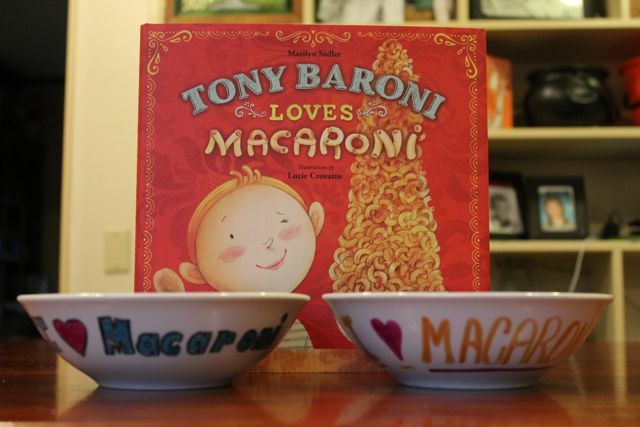 His Nonna Sofia wishes he didn't eat macaroni for breakfast, at noon, and then at dinner with a big serving spoon. She tries to break his eating habit by preparing many tasty pasta dishes, but Tony refuses. Then one day, all by himself, he decides enough is enough and asks Nonna to make him a new meal. 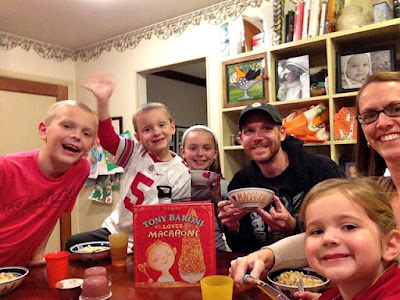 The new meal is a winner, but Tony now wants it for breakfast, lunch, and dinner. Nonna Sofia can only smile and so will your family when they read this book! My youngest two children were in a crafty-mood one day after school this week. 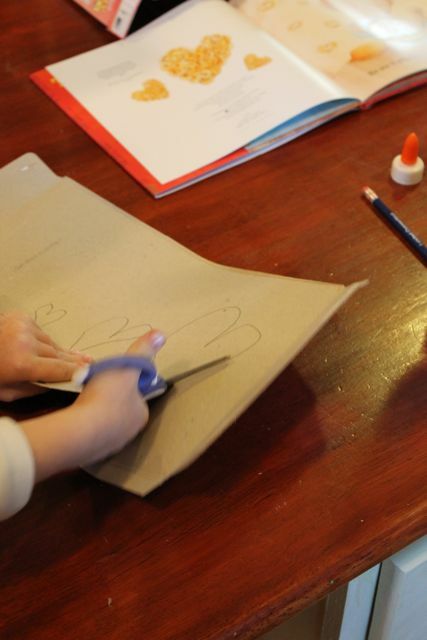 I seized this creative energy by asking my son to draw a heart on the back of a cereal box. I said, "Can you draw one bigger?" He drew another heart. I said, "Can you draw a bigger one?" 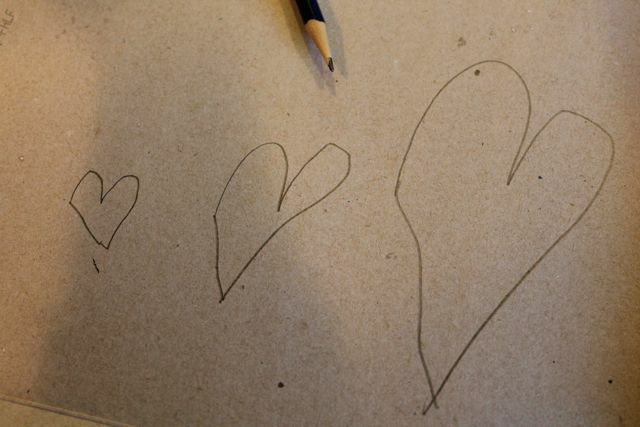 He drew another heart. I said, "Perfect." 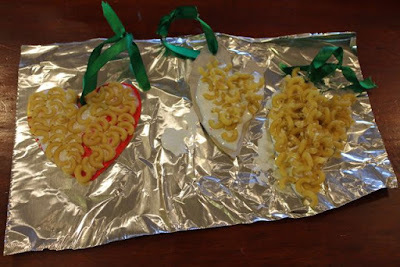 We used this drawing for their macaroni heart-shaped ornaments. They cut out the heart shape, punched a hole near the top, and threaded and tied a green ribbon. 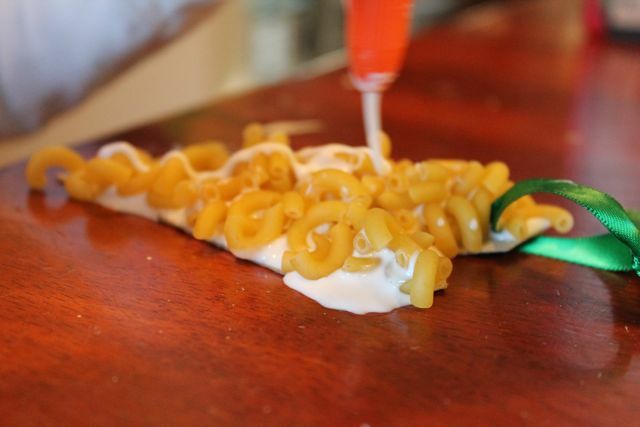 My children squirted glue all over the cardboard heart and pressed in the macaroni noodles. My daughter said, "Oh, we can put these up on the Christmas tree when they dry!" My son piled more and more macaroni noodles. 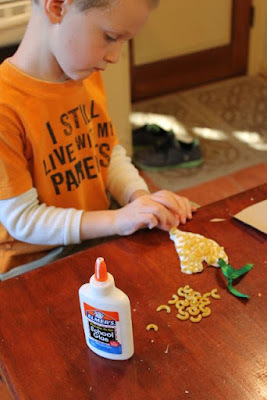 He squirted glue all over the top to make sure the all the noodles would stick when dried (and they did!). The macaroni ornaments dried on a piece of aluminum foil. I thought it would be better for them to stick to the foil than to the table! The second birthday celebration activity was to make personalized "I Love Macaroni" bowls just like Tony Baroni's bowl in the book. The goal of this project was for my children design their own macaroni bowl with their name and then we would use the bowls to eat homemade macaroni and cheese for dinner. I researched this project to make sure it wouldn't fail. 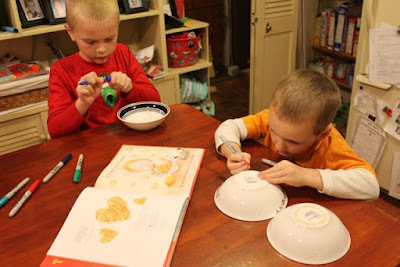 I investigated numerous "Design Your Own Bowl" activity kits but found them too expensive. I found many DIY Sharpie Marker projects online but results were varied. I couldn't decide what to do so I went to Wal-Mart to see what I could find. I thought maybe I could find plastic bowls they could draw on. Surprisingly, I couldn't find white plastic bowls. But, I did find inexpensive ceramic bowls in the dinnerware aisle. While at the store I read more articles about people using Sharpies to decorate mugs, but there was no clear successes on how to keep the marker from washing off. Since, the bowls were only 88 cents I decided to give it a try. While all of my children were at school I wrote with red Sharpie marker on the bottom of a bowl. Then, put the bowl in the unheated oven, turned it on and brought it to a temperature of 450 degrees. Once, it was at 450 degree, I set the timer for 30 minutes. 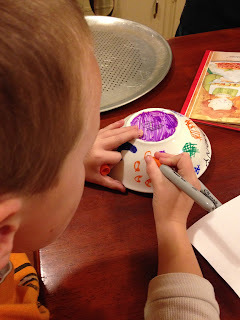 The theory behind this approach was that the glaze on the bowl would heat up and incorporate the ink. Then, when it cooled the ink would be a part of the glaze. This approach made sense to me. The ink looked like this before the 30 minutes in the oven. And like this after the 30 minutes in the oven. The red ink faded to orange, but it didn't wash off! This was good enough for me. I decided to try it with the family. Later that day, I assembled the family and they started decorating right away. I said, "Wait! Stop!" I had a few things to tell them. "First, your colors may change, so don't be mad if you write your name in blue and it turns gray. 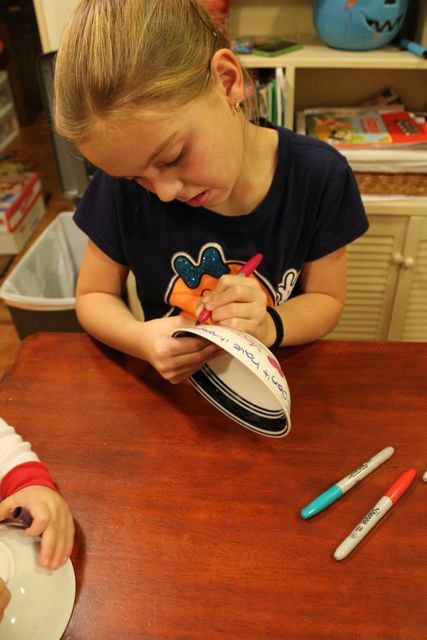 Second, turn your bowl right-side-up to write your name otherwise it will be upside down!" My youngest son used a red marker to draw a sun because he knew it would turn orange. She turned her bowl right-side-up to write an important message. What's itironophobia? I had no idea. She told me it means having a fear of noodles. Who knew? My daughter just wrote a story for a school assignment about a girl with this unfortunate phobia. How awful would that be? 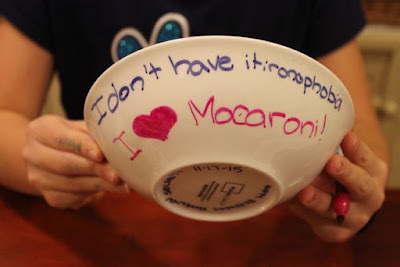 Tony Baroni definitely doesn't have itironophobia! 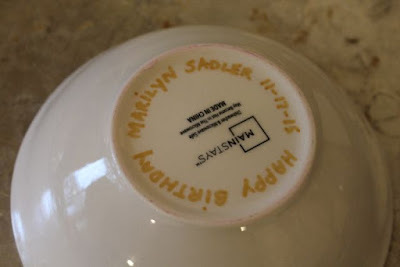 All the decorating was added to the outside of the bowl. 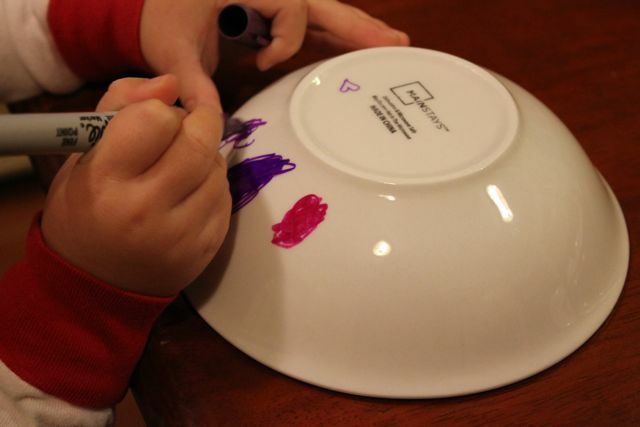 If the Sharpie did come off we didn't want purple macaroni! My youngest son thought he was finished with this project a few times, but felt he could add just few more designs. 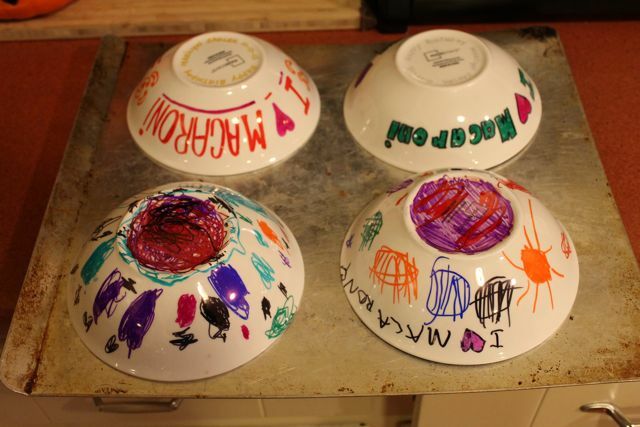 Our bowls were decorated, but I was a little nervous for the next step. 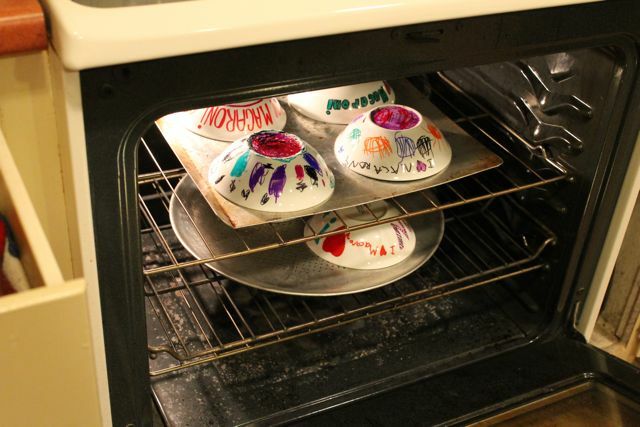 Remember -- put the bowls in a cold oven, bring to 450 degrees, and then bake for 30 minutes. Let the bowls cool on the kitchen counter. The bowls worked! Some colors faded more than others, but overall they turned out great. I hand-washed them twice without problems. I would suggest hand-drying them too! The next night for dinner I made homemade macaroni and cheese. Here is a link to my favorite recipe. A family meal served in bowls we designed! 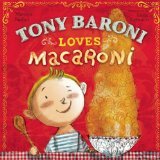 This family loves macaroni and cheese and Tony Baroni Loves Macaroni! Marilyn, our family hopes you have a wonderful birthday. It was so nice to meet and talk with you at Loganberry Books last summer. Thank you for writing books that kept our family entertained all week!